Having never made Manhattan clam chowder before (and rarely, if ever, having eaten it), we researched several recipes and ended up adapting this one for our New York challenge. 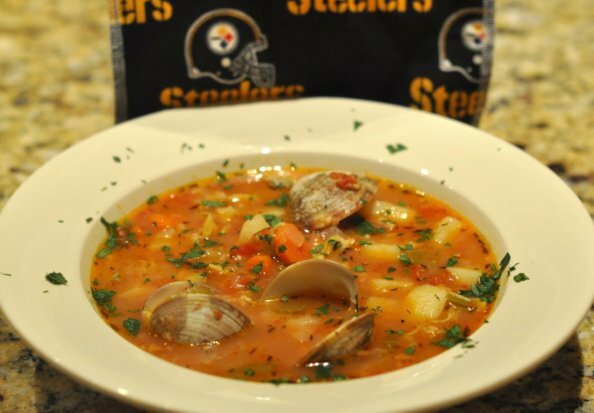 The ingredients include bacon, olive oil, carrots, celery, onion, garlic, white wine, dried thyme, bay leaves, diced tomatoes, clam juice, potatoes, canned baby clams (way better than they sound), live clams, hot sauce and salt & pepper. Heat the olive oil in a Dutch oven (or other heavy-bottomed pot) over medium-high heat, then add the bacon (cut into thirds) and cook, stirring occasionally, until the bacon browns and gets crispy — about 10-12 minutes. Remove the crisp bacon to a cutting board, but keep the rendered fat in the pot — that’s the good stuff for sauteing veggies. Once the bacon cools, chop or crumble it into small pieces. Add the carrots, onion, celery and a generous pinch of salt to the pot and cook until the veggies soften — about 6-8 minutes. Add the bacon and garlic and cook until fragrant — about 1 minute. Add the white wine and stir to scrape up any browned bits from the bottom of the pot. Cook until the liquid reduces — about 2-3 minutes. Add the clam juices — the bottled clam juice and the juice from the canned clams (you’ll add the clams later.) You might be thinking, that’s a lot of clam juice. (I sure was.) But, surprisingly, the overall flavor of the finished dish does not scream clam, not even a little bit. Add the tomatoes (with their juices), thyme and bay leaves. Stir it all together and turn up the heat. While the broth is heating to a boil (which takes a little while), peel and cut the potatoes and add them to the pot. Once the broth (with potatoes) starts to boil, cover the pot, reduce the heat and simmer until the potatoes are done — about 30-40 minutes. You can tell the potatoes are done if they smash easily with the back of a spoon against the side of the pot. We like to smash about 1/3 of the potatoes in order to give the finished chowder a bit more of a silky texture. Plus, the clams should be the star of this dish, not the potato. Potatoes have this, allow the clams to shine here. Add the canned baby clams. As unappetizing as “canned clams” sounds, they’re basically just pre-chopped little clams. Add the live clams, cover the pot and cook until all the clams open up — about 5-10 minutes. Add a bit of hot sauce for a little kick (we love Cholula, but Tabasco, or Louisiana Hot, or whatever kind you prefer will also work), then taste and add salt & pepper as needed. Garnish with chopped parsley and serve with good sourdough bread. We were pleasantly surprised by how delicious the chowder turned out and would definitely make it again. For anyone keeping track, so far, the Steelers are 1-1 in terms of wins, and Foodie Lawyer is 2-0 in terms of successfully delicious meals in the S.O.C.C. Winning! Heat the oil in a Dutch oven (or other large, heavy-bottomed pot) over medium-high heat, add the bacon and cook until browned and crispy — about 10-12 minutes. Remove the bacon to a plate and chop or crumble it into small pieces when it cools. Add the carrots, celery, onion and a dash of salt to the rendered bacon fat in the pot and cook until the veggies soften — about 6-8 minutes. Add the garlic and bacon and cook until fragrant — about 1 minute. Add the wine, stir to scrape up any browned bits from the bottom of the pot, and cook until the liquid reduces — about 2-3 minutes. Add the jars of clam juice and the clam juice from the canned clams (reserve the clams.) Add the tomatoes, thyme and bay leaves and turn up the heat. While the chowder heats to a boil, peel and cut the potatoes and add them to the pot. Cover the pot, reduce the heat and simmer until the potatoes are done — about 30-40 minutes. Smash about ⅓ of the cooked potatoes with the back of a spoon against the side of the pot. Add the canned clams and the live clams (if using) and cook until all the live clams open up — about 5-10 minutes. Add a few dashes of hot sauce and salt & pepper as needed. Garnish with chopped parsley and serve with good, crusty bread.